I’m late for work, an early morning meeting has been scheduled and it’s raining like crazy. The streets are clogged, the elevated trains are running really slow and people are huddled four deep waiting on every corner for a bus, any bus, but there are none to be seen. Although I’m stuck in the traffic, I am at least warm and dry listening to my music. I am living large in the Plastic Age ensconced in my mobile metallic cocoon. 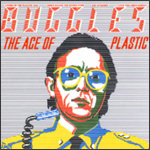 Enveloped in the stereophonic sound, I’m listening to a new album by the Buggles, The Age of Plastic. With its symphonic structures, it is post punk electronic pop at its best. I have always liked the inspired songwriting, musicianship and impeccable production of this album. In spite of the fact that it is known for the iconic second track, “Video Killed the Radio Star,” which is forever immortalized by being the first song ever shown on MTV, I have always been partial to the first track. Little did I know while it played I was about to be dragged into someone else’s Plastic Age crisis. I’m not going anywhere. Waves of rain wash across the windshield. The streets are gridlocked. I am lost in the music until I notice a young woman running frantically from car to car and yelling something to the drivers. Her desperation is unnerving, I am wishing the traffic would move, even just a few car lengths would do, but no such luck. Whatever she wants she‘s not getting it from any of the cars around me. Oh no, it’s my turn, but as she approaches she has stopped shouting and waving her arms, she is suddenly more focused, her demeanor has changed from imploring to seeking. She is dressed for an office job downtown, but she is soaking wet. She’s not looking at the drivers any longer, she’s not looking at me. By the way she is staring at the sides of the cars it is apparent she is searching for something. Oh no, she is searching for an unlocked door and she’s found one. Unfortunately it’s the passenger door on my car. What’s this pain here in my chest? Pulling the door open, she jumps in, flooding my interior with rainwater. She begins her rapid fire explanation about how she desperately needs to get to work, the elevated train was stalled and she got off but there were no buses and even if there was one it was going to move even slower than car traffic and could I please give her a ride downtown she was late because the woman that watched her kid during the day was late and she had to be at work by a certain time … whoa, whoa, slow down, stop. I quickly decided that although frantic she was basically harmless so I agreed to take her downtown and besides I didn’t think she was going to leave had I asked, at least not without a fight. Then she might not have been so harmless. It was kind of a benign chauffeured carjacking. But it was a win win situation. I got to keep my car and she didn’t have to ditch it after she got to her destination. We talked, she calmed down, she dried off a bit as traffic eventually moved a little faster but we were both extremely late. I was even later because I took her into the Loop and dropped her off in front of her building and had to backtrack to get to my office. For many years I thought there was no moral to this story, but ever since that day, the first thing that I do as I back out of the garage in the morning besides adjusting the volume on the stereo is … I lock all the doors!